If you’re organized and you’d like to pass that along to other coworkers, this is a great piece of software. It’s easy to add fields for customers and leads, keeping pertinent information accessible for all entries. That information is easily trackable, with a great search tool that will find absolutely any query by searching across all entries. Pros: The search bar makes finding ANYTHING very quick and easy. Also, the ability to see emails between colleagues and leads/customers. It's a great tool for support teams. Cons: I love the organization of Close.io, but there are so many possibilities to keep track of, it can be overwhelming. 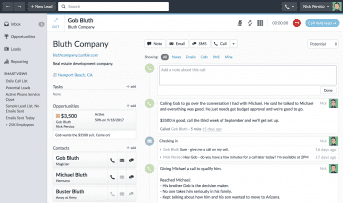 Close.io is a sales-oriented CRM platform released in 2013 by Elastic Inc. Developed as an internal application in support of Elastic’s initial operations as an outsourced sales team – scalable Sales-as-a-Service – the software’s early iterations were popular enough with other salespeople for Elastic to rethink its focus. 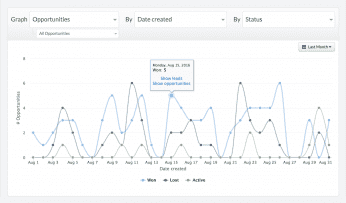 After further development, Elastic began promoting Close.io as an integrated sales platform on a subscription basis. Elastic Inc. is currently based in Mountain View, California. It was founded in 2012 by Steli Efti, Anthony Nemitz and Thomas Steinacher as a Y-Combinator startup. All Plans have unlimited Contacts, Leads and Opportunities. Close.io subscriptions can be paid monthly or yearly. Yearly subscriptions are 10% off. All Plans include a 30-day money back guarantee. Basic, $65 or $59/user/month: Contacts and Leads Management, Opportunity Tracking, Windows/Mac Native Application, 2-way Email Integration, API Access, Customer Support by Email. Professional, $110 or 99/user/month: Same as Basic Plan + Bulk Email Sending, Automatic Call Tracking, Phone Number and Unlimited Calling in U.S. and Canada. Business, $165 or $149/user/month: Same as Professional Plan + Phone number and Unlimited Domestic and International Calls, Call Audio Recording, Toll-Free Number and Ring Groups, Voicemail Drop, Call Transferring, Custom Reporting Graphs. Close.io’s website also offers a searchable Support Center with a Getting Started Guide, a Live Training Workshop, a diverse library of how-to articles and FAQs on topics including Search, Account Management, Email, Calling, Integrations, Networking for VoIP and other key functions of the platform. The Support Center also has an Email Support button which allows contact with the company through their website. Close.io bills itself as a sales communication platform built “by salespeople, for salespeople.” So it’s not really apt to compare it to full-fledged CRM platforms, because Close.io does not attempt to meet that standard. Therefore, if your business wants robust marketing automation features, advanced reports, or even a mobile application, then you’ll want to look elsewhere. However, if sales is not merely part of your business, but most (if not all) of your business, and your salespeople work primarily from desk-based workstations, then Close.io has a lot of features your people will love. First, it streamlines contact, lead and opportunity management, and updates itself when the statuses of each are changed. The goal is to reduce to a minimum the amount of data entry required – which the Elastic team felt was a drawback of other CRM options – and the software largely succeeds. Second, the tight integration of call and email functionality means salespeople can perform the essential functions of their jobs without needing to switch interfaces. (Also note the desktop client and browser-based version are virtually identical.) Close.io has a built-in VoIP calling system, but recommends Tenfold – a Computer Telephony Integration platform – if you’d like to integrate your existing VoIP provider. Close.io does not seem to have many official integrations, but it handles its primary functions quite well for itself. It uses Zapier for its third-party integrations, as do many CRMs; this allows it to incorporate functions from MailChimp, Wufoo, and Google Apps. Clients also have access to the developer API. 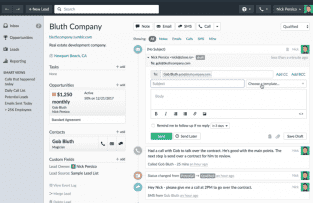 In short, with the automatic calls and email logging, the integrated communication features, and the reduced need for data entry, Close.io has a lot of features that a sales team could love. The price point is fairly high for a platform lacking in CRM features; on the other hand, Close.io’s high level of streamlined functionality within that narrow scope may make it well worthwhile to a sales-heavy company. If direct sales over the phone or internet is your primary business, then you have everything to gain by giving Close.io its two-week free trial. What Do You Think of Close.io?